Dying churches in survival mode. 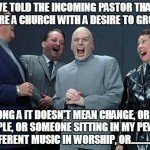 Churches on life support that don’t want to revitalize. Churches that put all their faith and burden in the pastor to save the day and make it grow, as if the pastor is a savior in the flesh. I’ve listened to stories of burned out pastors, conflicted congregations, and even potential lawsuits among the leadership. 50% of pastors are so discouraged they would leave the ministry if they could, but have no other way of making a living. 85% of pastors said their greatest problem is they are sick and tired of dealing with problem people. 90% of pastors said the hardest thing about ministry is dealing with uncooperative people. Moses was the target of complaint. This week, I’ve been meditating on the people of Israel leaving Egypt. “All the people grumbled against Moses and Aaron.” Numbers 14:1. I think many pastors, when they are hired (or called) as change agents have stepped into this kind of circumstance. They feel the pain of Moses and Aaron. The group of people who once looked to you to get them out of their survival and into a new land, have now turned against them. The people that invited you to come, to serve, and enjoy have now turned on you. At first, you were their hero, and now you are the source of their grumbling. Rumor, gossip, slander, and perhaps even false teachers undercut you as the leader. I don’t remember conflict training as part of Moses’s official training. In my own seminary experience, that wasn’t part of the deal either. Perhaps seminaries should offer more in this area, and likewise, perhaps church governing bodies should intentionally help pastors get this kind of training. I can’t tell how many stories I’ve listened to in the last 30 days that seem to parallel this context. 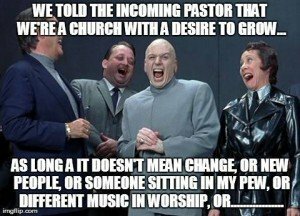 How many pastors have observed that the congregation doesn’t really want to change? After all the study, the praying, and the innovation. After all the money spent to send teams to leadership conferences. After all the effort to survey the congregation, cast the vision, and then lead the people out. One pastor I spoke with has a church that said we need to transform or die. He spent a few years casting vision, helping the congregation see what changes were coming. He followed the playbook, so to speak. But when push came to shove, the people rebelled. They complained. They griped, and they began to whisper among themselves that they needed a new pastor. . . just like the Israelites wanting a new leader. Moses led the people into huge change. They wanted to make it. Imagine all their effort into organizing their departure, all the effort to obey the instructions to participate in the Passover. All the work to make sure that fled with only what was necessary. Where do you see yourself in this story? Check out this old video of the late Keith Green singing about the group leaving Egypt. Song starts about 3:15 into the video if you don’t want to hear the opening commentary. As I listened to it again, I found so many parallels to the church transformation process. . . .
Each week, I send out a few articles related to personal evangelism, church welcoming, and all sorts of issues that transformation pastors must deal with in their congregation. I write articles to help you with changing such attitudes in the areas of personal evangelism, church hospitality, greeter training, and hopefully helping you break fixated habits of your volunteers. Sign up and you won’t miss new stuff.